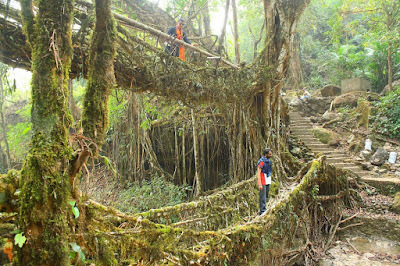 The Double Decker Living root Bridge is one of the most breath-taking sights in Meghalaya. 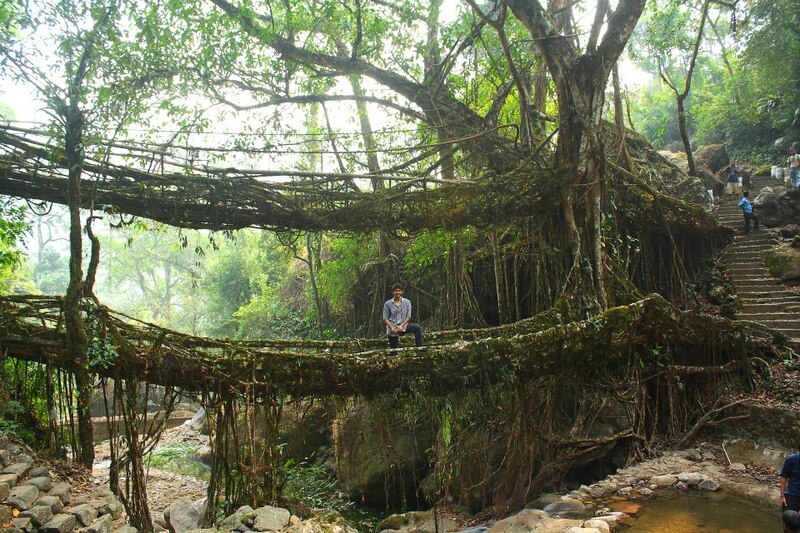 The bridge lies in the Umshiang village, straddling a stream in the deep valley amid the high hills of Cherrapunji. 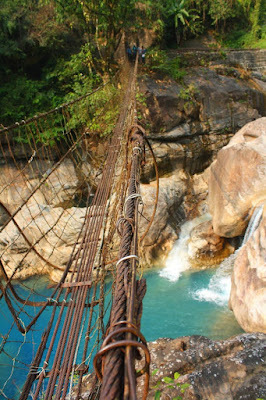 The bridge is approached after a trek from the village of Nongirat - an inverse trek that starts with a descent to the velley and wraps up after the ascent back to Nongirat. 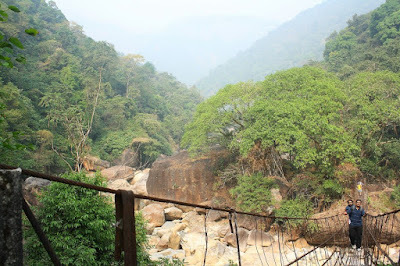 An alternative route is to ascend to Nohkalikai Falls on the other end of the valley, instead of returning to Nongirat. We were three days down in Meghalaya by this time and were geared up for the first major adventure of the trip. The itinerary for the day was simple enough: start off early to Nongirat, trek to the Double Decker Living Root Bridge, return for lunch at the Cherra Holiday Resort and then maybe cover a few sights around Cherrapunji. It was about 0930hrs by the time we started off - after a quick stop at Cherra Holiday Resport to place our lunch order and contact Don, the guide - which was about mid-day here in Meghalaya. 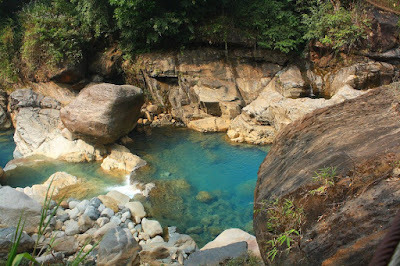 Cherrapunji (Sohra) and Nongirat are located on tall ridges at a considerable elevation from the deep water-cut valleys below. The bridge is in Umshiang down one such water-cut valley. 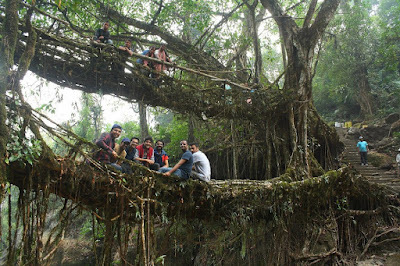 The starting point of the trek has a board which states "Double Decker Living Root Bridge: 3Kms". This is one of the most innocuous signs we saw on our entire trip. 3kms one side = total distance of 6kms. Typically, time taken to cover this distance can be just a little over 2hrs. However, this place is far from typical. 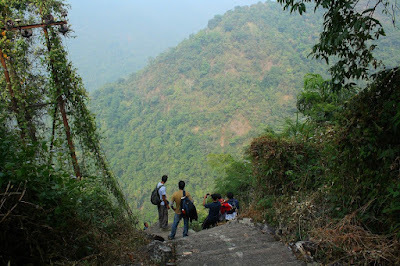 The trek route starts with stairs. 2700 stairs in all. 2000 of them are together at the start, the rest are scattered. The first 2000 stairs all go down. This is the worst section of the trek, especially when returning. Almost all the steps here are 6inch high and 6inch wide, which may be comfortable for the locals, but for someone with a size eleven foot it means that only half the foot lands on the stair at a given time. 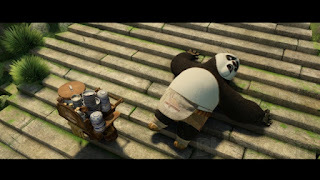 It is also not advisable to skip any stairs as the impact starts to hurt after a while. In memory of the 2000th step! 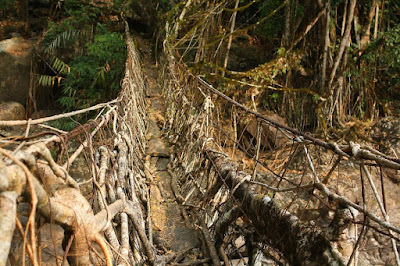 There is a small settlement at the base of the stairs with a fork for a living root bridge, located about 1.5hrs away. 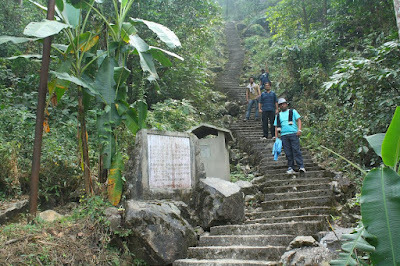 The stairs continue outside the village, but here they are punctuated by flat stretches with gradual elevation changes. At the end of this stretch, one comes across a suspended steel bridge. This bridge is small and on a beautiful stream: crystal clear mountain water! After this bridge we came across another steel bridge, this time only longer and with a stunning backdrop. 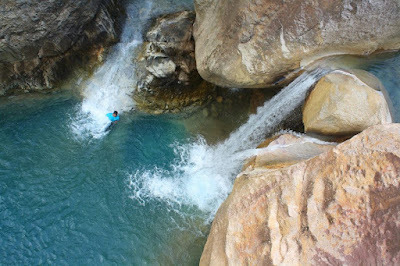 Picture this: Green trees on sloping mountainsides, white boulders marking the path of the stream, clear blue flowing water amidst the rocks and then us, standing awestruck in thin air on a bridge made up of steel cables. Paradise! 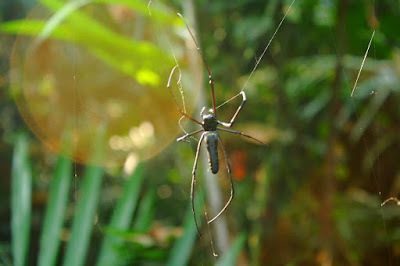 Our guide Don was reminding us of our target: the Double Decker Living Root Bridge and we moved on. 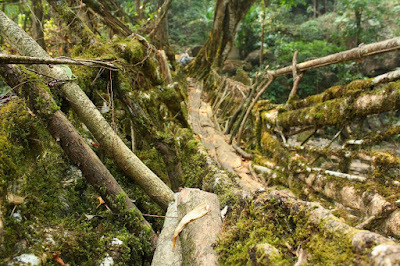 After the second steel bridge, we came across an inconspicuous living root bridge - our first. 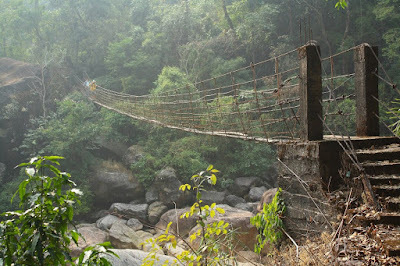 This was a small single decker bridge, a fact which most of us realized only after going halfway through. We had a small photo-op at the bridge and moved on. 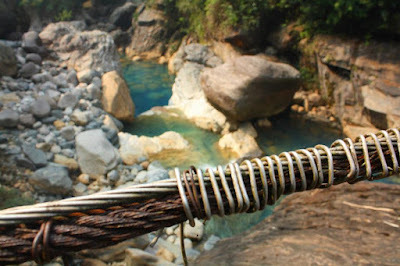 A little far from this bridge lies the village of Umshiang, which is home to the Double Decker Bridge. The first sight of the Double Decker Bridge is a massive letdown; only because you see it as a path and nothing else. 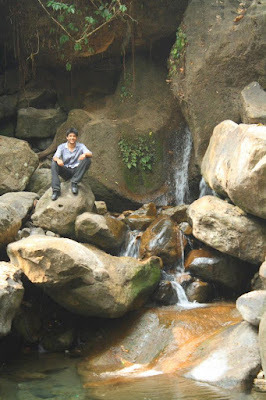 The best thing to do now is to cross the bridge and get a seat on the rocks on the other bank. This is the view you are looking for: the Double Decker Bridge in its full glory. The view here is amazing, especially with the sun-rays filtered through the leaves of the surrounding trees. The Umshiang guest house is close by for people seeking an overnight accommodation near the bridge. 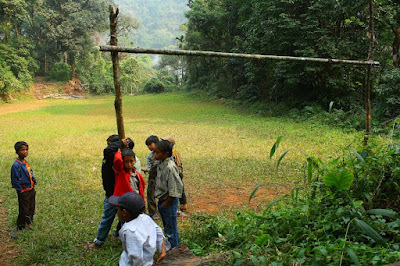 Alos close is a small football ground with a level pitch and bamboo goalposts. The presence of a football field was very startling; especially in a place like Umshiang whose only access to the world was through the bridges. Don, then mentioned of another steel bridge a little distance away and we decided to check it out. 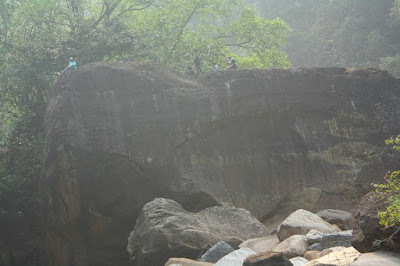 This bridge lies on a path to the Nohkalikai falls which is at a walk of about three hours more. The next steel bridge is the longest (in two parts) and the most precarious of them all. The view here is again splendid. 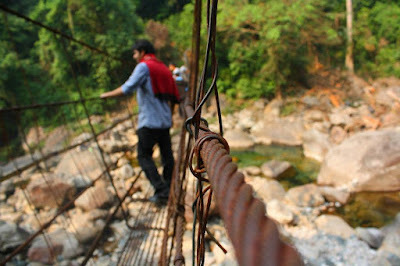 At the end of this bridge starts a root-bridge-in-making based on a steel framework, followed by a short bamboo bridge. Some of us decided to venture in the river below, but kept away from the water. We returned to the guest house from this point. We had a tea break and then decided to move on. It was already 1300hrs by then. We did a quick photo-op at the double decker bridge and headed back to Nongirat. Some of us then ventured in the water below the second steel bridge. I do not know how to swim. This was the first time of many on this trip when I repented the fact. It was almost 1400hrs by the time everyone gathered at the base of the 2000 stair climb. The humidity had increased as the day went by and all of us were sweating. For the next two hours all we did was huff-puff-stop-curse-repeat! The climb never seemed to end! We reached the start point by 1600hrs. I would like to state that most of us were good trekkers in the Sahyadris, but we were not prepared for what we got here. The locals do it quickly enough and are quite chilled about the entire affair. We moved to Cherra Holiday Resort for lunch by sunset. We tried a few local dishes (I cannot remember the local names) like yellow pork rice, radish salad, dry fish chutney, pork gravy and pork dry. After a sumptuous meal, we headed back to the Coniferous Resort where we were staying. It was already dark by the time we reached and any hopes of site-seeing were already dashed. Thus ended our good day's hike. Nice writeup. I am planning to visit this place. Which season is better? I would prefer a place closeby to stay, so that I can spend more time near the bridge. November through to February is a good time. 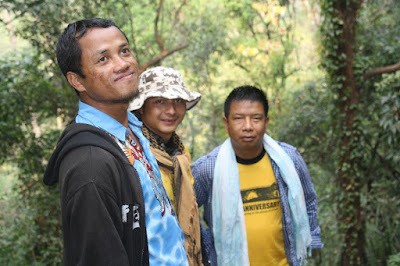 Guest houses are available in Cherrapunji and Umshiang.